It is time for a GLOSSYBOX Box Opening! February's box theme is "International Style". Very fitting for an international beauty box subscription! In the vast sea of beauty sample subscriptions, GLOSSYBOX is really a standout! If you can afford the extra $21 a month for luxury beauty samples, then GLOSSYBOX is the way to go! Other great beauty sample boxes? 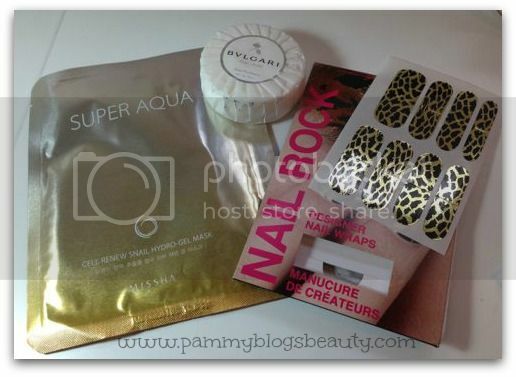 Julep for nail lovers ($20 per month) or Birchbox ($10 a month). While I personally no longer have a paid GLOSSYBOX subscription, I am happy to review press samples of the GLOSSYBOXes! Each box is like getting a beautifully wrapped beauty gift in the mail. There is no question, these boxes are a total treat! I really loved getting GLOSSYBOXes. However, after 6 months, I decided that I wanted to try using that $21 a month to build up my MAC core collection. So, my MAC Matters series was born! :) If you haven't had a chance, be sure to check out that series (and, no, you don't have to cancel a beauty box to join in the fun of the MAC Matters challenge! It is just a fun way to curb beauty spending!). For $21 a month you get a deluxe package of 5 beauty samples (at least one of which will be full sized). 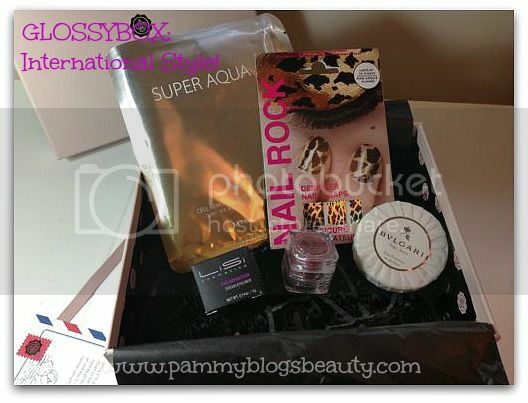 GLOSSYBOX tends to feature luxury brands and boutique items. I have gotten everything from lipstick to body butter and everything in between. Not only do you get to try out luxurious products, but also you get introduced to new brands! Also, it can help you to get out of your "beauty rut" and branch out. 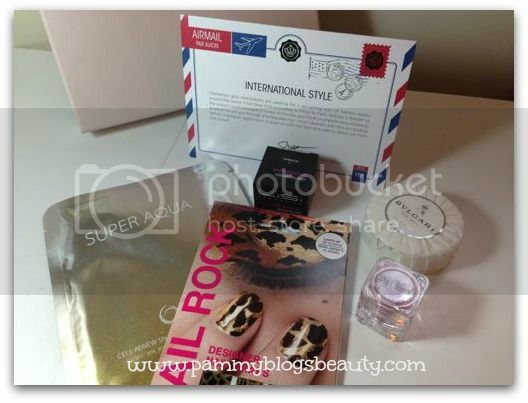 Want to see what was in February's International Style box? Just keep reading! Guess what??? OMG! ALL of the samples in this GLOSSYBOX are *full sized*!!! Wow! Thank you GLOSSYBOX!!! Bvlgari | Eau De Parfumee Au The Blanc soap (Full Sized!!! Cost: $30): Ooooooh! I love the scent of Bvlgari!!! So, I am just thrilled that GLOSSYBOX included this luxurious soap in this month's box. When you open the box, you immediately get hit with the lovely fragrance of this soap! I seriously can't wait to use this! I am a bar soap girl. So, this is the perfect luxury shower treat! As you can see from the $30 cost of this soap, this one item alone more than pays for your GLOSSYBOX! Da Vinci Cosmetics | Shimmer Powder in Wild Lilac (Full Sized! Cost: $15): This is a shimmering mineral powder. The GLOSSYBOX card states that you can use it as a highlighter, blush, or shadow. However, I think this color is best suited as an eye shadow. What a pretty color!!! Can't wait to try this out. I am not at all familiar with this brand. So, I am happy to discover it through GLOSSYBOX! Lisi | Eye Definition Cream Eyeliner (Full Sized! Cost: $10): Another item from a new (to me) brand! I have never tried Lisi. So, I am excited to give this cream liner a go. I am a huge fan of creme liners. What a beautiful shimmery teal color! 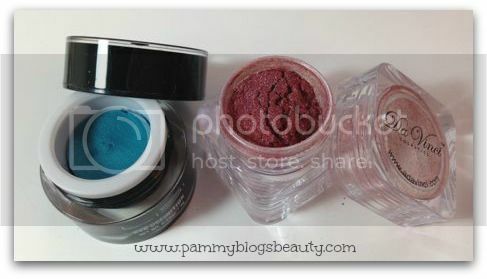 This is going to be perfect for Spring and lovely with my blue eyes and fair complexion! Yay!!! If I like it, I will have to keep this brand in mind as $10 is an excellent price for a creme liner. MISSHA | Super Auqa Cell Renew Snail Hydro Gel Mask (Full Size: Cost: $6 each): Whoo-hoo! I love sheet masks! This one looks specifically designed for the eye area. If it is anything like my beloved Eye Mask from Le Metier, then I will love it. GLOSSYBOX states that these hydro gel masks are an Asian beauty secret that moisturizes, soothes, and regenerates skin while reversing damage. Sweet! Can't wait to try! However, I do wonder...is their snail in it??? That may sounds silly; but, snails really ick me out, lol! What a great month for GLOSSYBOX! A box full of sample sized items!!! :) I am very excited about the items and can't wait to try. Please let me know if you would like to hear a full review of any of these items!